Spin-off films have a notoriously bad track record, from X-Men Origins: Wolverine to The Scorpion King, they usually reek of desperation to keep a franchise going beyond it’s expiration date. Going into The Bourne Legacy, the fourth film in this franchise, I was skeptical that this film could capture the spirit of the previous installments without Matt Damon and director Paul Greengrass. I am rarely so glad to have my suspicions proven false. 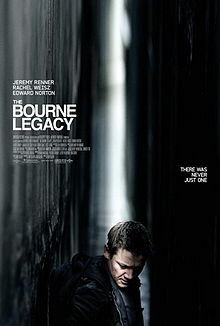 Legacy is a ‘sidequel’ running more or less parallel to the events in The Bourne Ultimatum. In that film, ‘Treadstone,’ and Operation Blackbriar, the program that spawned Jason Bourne, is exposed. Concurrently, Legacy shows the government attempting to clean up other programs connected to Bourne. This effort is led by Eric Byer (Edward Norton), who wants to wipe out all of the program’s scientists and agents, including Aaron Cross (Jeremy Renner) and Dr. Marta Shearling (Rachel Weisz). They, of course, go on the run, and the game begins anew. This film moves series scribe Tony Gilroy to the director’s chair, and while he retains the familiar handheld camera work and kinetic action of the Bourne films, many of the action sequences in Legacy are indecipherable. Renner’s choreographed sequences suffer the most, with Gilroy getting a little too close to the action which results in a muddled array of quick cuts punctuated by crackles of broken bones. Gilroy does succeed in broadening the world of Bourne while giving us a mostly self-contained story with new characters. The plot has most of the overall structure from the earlier films with enough new twists on that formula to make it not feel like a rehash of what we’ve already seen. Like its predecessors, Legacy is as smart as it needs to be, explaining just enough to keep the audience not completely in the dark. It also continues one of my favorite aspects of the series, and something that separates it from many other modern action films; it shows rather than tells. Cross doesn’t explain how he is acquiring a passport or forging a document, but we see him do it. Like the best action films, Gilroy knows when to kill the dialogue and let the images speak directly to the audience. Gilroy and Renner prove that they are up to the spin-off challenge, and deliver a film that should please fans of the series while bringing in new ideas to keep Bourne on the run. The Bourne Legacy opens today in Philly-area theaters.